Adventure is a path. Real adventure…self-determined, self-motivated, often risky…forces you to have firsthand encounters with the world. Saturday, April 9, 2016: Up early, and slowly prepared the camper for exiting one of the most beautiful places on earth. A quick walk to the visitor’s center for some last minute souvenir’s and a few more moments gazing at the magnificent sandstone formations that envelope the valley of Zion National Park. 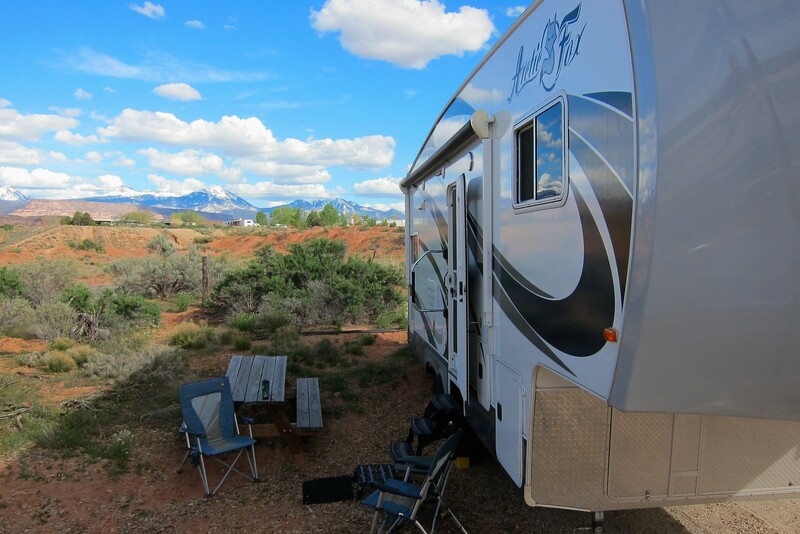 Kit and I have camped at and enjoyed many of the 411 units in the National Park System. This year marks the park service’s 100th Anniversary and it is a special time to get out and enjoy the parks! 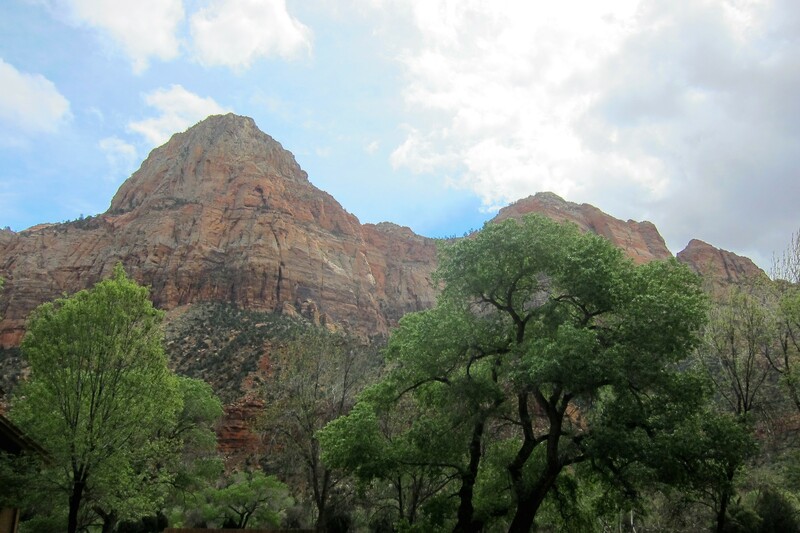 Of the 411 units in the National Park system 59 are designated as National Parks, such as Zion. The rest are National Monuments (82), National Historical Parks (50), National Preserves (19), National Historic Sites (78), National Battlefields (11), National Rivers (15), National Recreation Areas (18), National Seashores (10), and a smattering of Lakeshores, Parkways, and Trails. After a National Monument was established in the state of Delaware in 2013, there is now a National Park unit present in every state of the union and most US Territories. As a lover of Americas National Park System, I am a firm believer in the “Leave No Trace” ethos…Take Nothing but Pictures, Leave Nothing but Footprints! 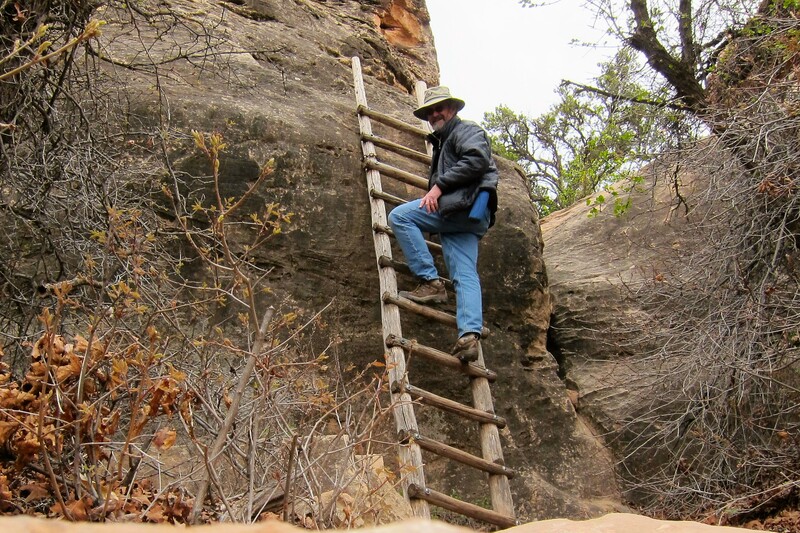 However, I must confess…at Zion National Park I took home a souvenir, and I left quite a mark that I had passed through! Yea, it looks bad, but it isn’t as bad as it looks! 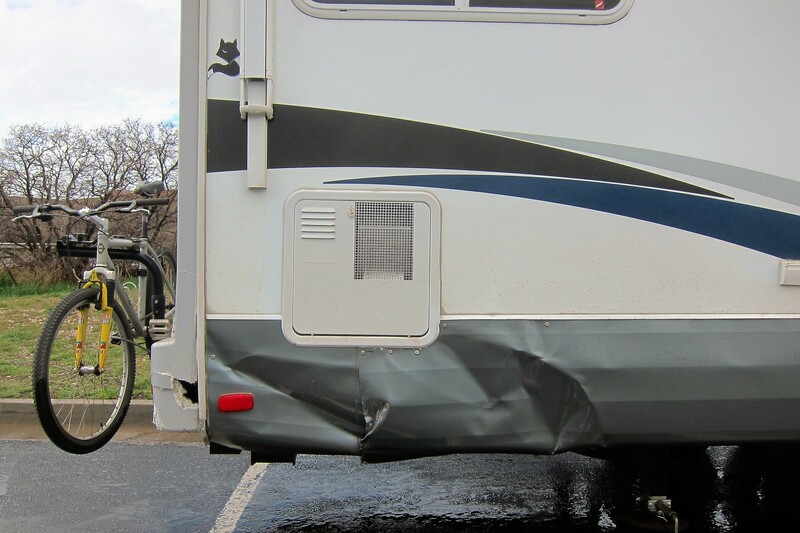 The damage is cosmetic, meaning that the camper is 100% operational. So, what happened? I figured someone would ask! Well, the morning we left the campground, I was maneuvering the rig in a rather tight space and Kit asked: “Want me to get out and spot you”? To which I replied, “Nope, I got this”! And……wait for it…..crunch!?!? Now, during the half of the year that we don’t travel, I can screw up and very few people learn of it…but when we committed to journal our travels on the World Wide Web, well, lots of folks learn of my SNAFU’s. The frustrating thing is not so much the damage, that’s repairable, it’s that I know better…in fact one of the acronyms I use to remind myself to maintain situational awareness is G.O.A.L. which stands for…Get Out And Look. Oh well, looks like I’ll have to take advantage of that insurance I’ve been paying premiums on for years. With tail firmly between my legs, and many fellow campers offering words of sympathy, we sauntered on down the highway heading east. 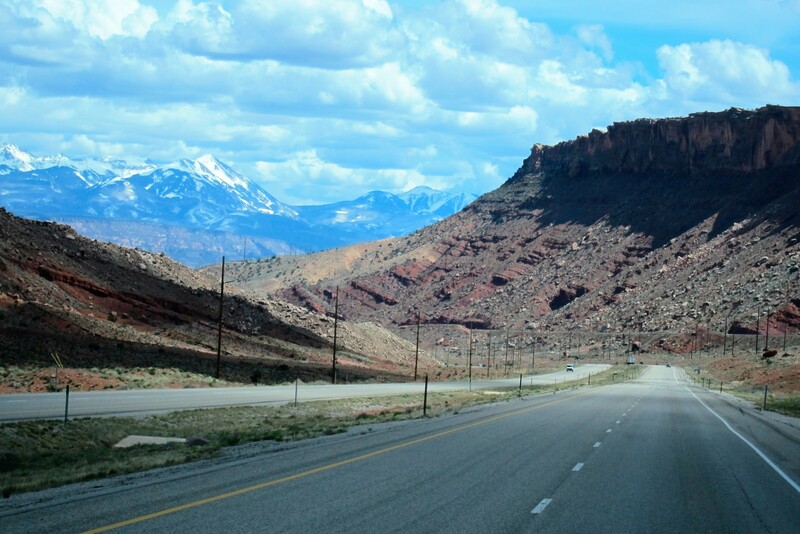 A few miles down the road, I started feeling better and even made a few wisecracks as we steadily climbed onto the high plateau of Eastern Utah where we spotted snow in the mountains ahead. Nearing the small Utah town of Richfield, the Engine Monitor detected a looming problem so I took the next exit off the interstate. Calling Chevrolet Customer Assistance, I was informed that there was a Chevrolet dealer in town! Great news, except they were closed until Monday!?!? Man, I can’t get a break today!!! Not wanting to chance engine issues higher up in the mountains, Kit used the All Stay’s App and found a nice campground that could accommodate us. So off we headed to the Richfield KOA and registered for a couple of nights stay. Owned by a very pleasant couple, who had semi-retired from their high pressure jobs, the campground was neat and well cared for. Not the kind of place we normally seek out for our overnight stays, but considering the potential truck issues, a great alternative. 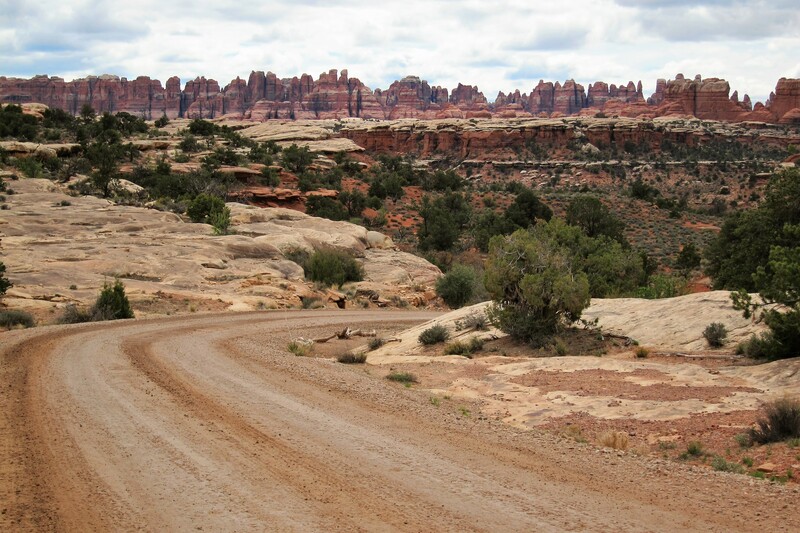 The campground was sparsely populated but come the warmer months, the place is prime camping for Off Road Vehicle (ORV) enthusiasts as the property abuts many major ORV trails that honeycomb the surrounding hillsides. Following a nice meal, Kit and I settled down in our new home base for the duration and did some research on things to see and do in the area before calling it an evening. 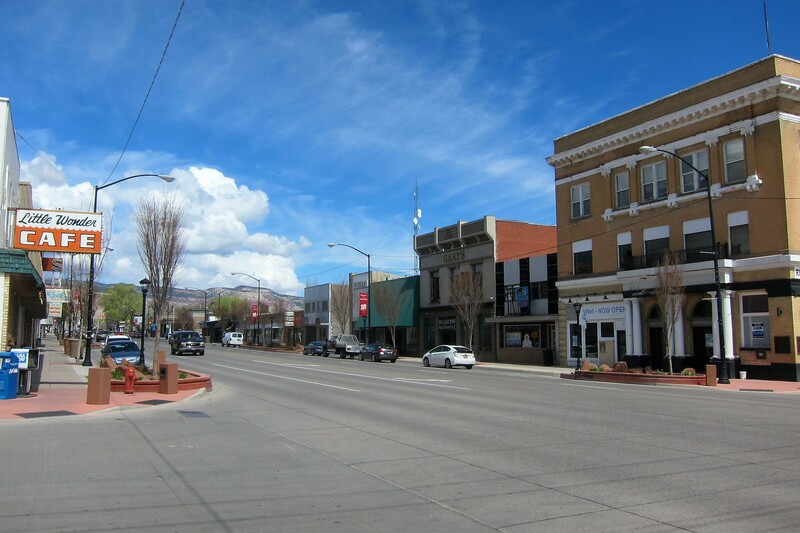 Sunday, April 10 through Tuesday, April 11, 2016-Richfield, Utah: Well, if one has to be stuck in a town, this is the one to be stuck in! Richfield is a small 7,550 population municipality that sits at 5,350 feet of elevation and as such, features four distinct seasons. It is considered a rural oasis as the next sizable town is over 100 miles away, so most surrounding folks use the town of Richfield as their major shopping, entertainment and cultural hub. We spent a full day walking about town and visiting with the very friendly locals. One of the places that Kit made a beeline for was the town library. This particular place is unique as it is a “Carnegie Library”, one of 1,650 such facilities built by the millionaire/philanthropist Andrew Carnegie. 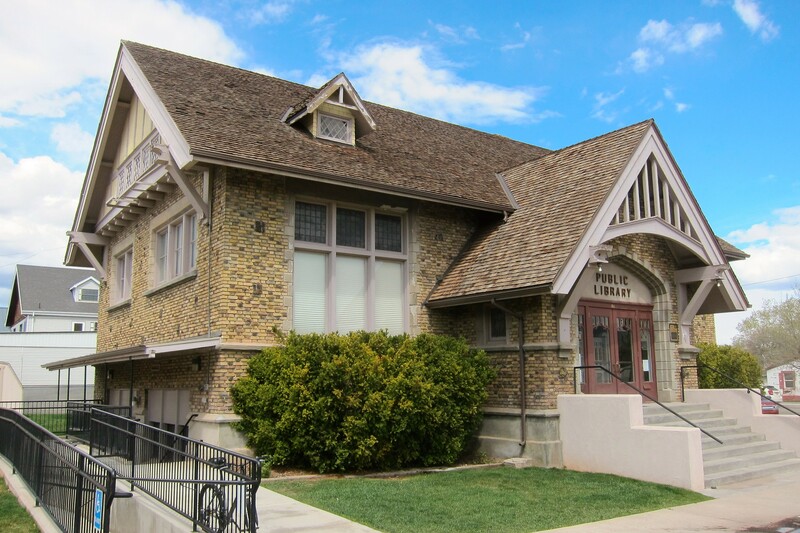 Constructed in 1914, it is one of the few Carnegie Libraries that was built in the Craftsman style. Professor Google tells us that Mr. Carnegie offered to build libraries throughout the United States providing the town donated the land and hired the library staff. By 1919 more than half the 3,500 libraries that existed in the US were as a result of his generosity. During segregation, many Carnegie Libraries were built near the cities White Only Libraries to give access to knowledge for black folks. While walking about looking for a great angle to photograph the library building, this gentleman walked up and asked if I needed anything. Come to find out, he is the Mayor of Richfield. 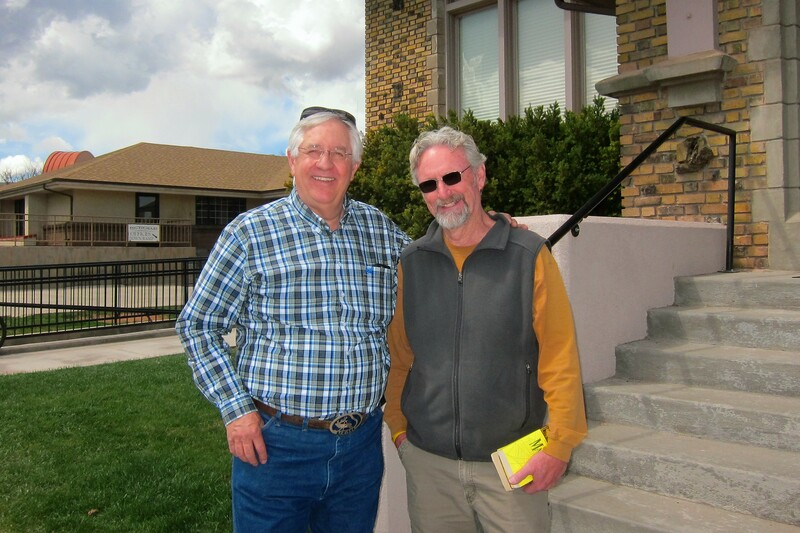 Dave hates to stay cooped up in his mayoral office so he walks about town and visits with folks…gotta love small town America! He and I had a nice chat while Kit visited with the librarian and browsed the shelves of books. By Tuesday, the truck was ready with a newly installed EGT sensor and we were ready to get back on the road. Even though this had been a forced layover, Kit and I both agreed it was a thoroughly enjoyable one! 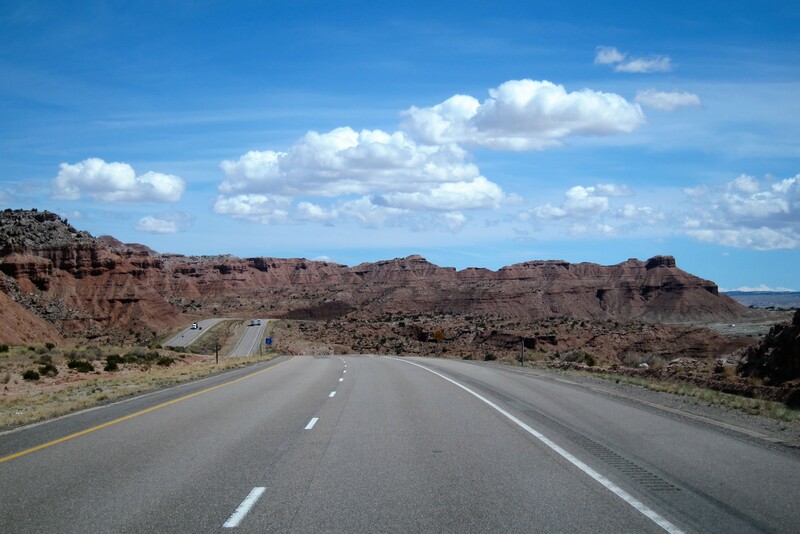 Wednesday, April 13, 2016: On the road by midmorning and heading east on I-70. The weather is clear with temperatures in the 70’s. 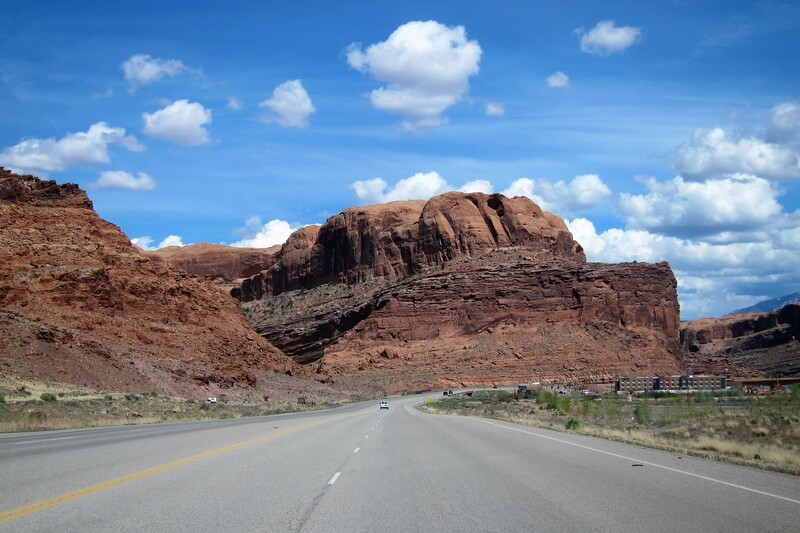 Soon the terrain morphed from high prairie to the more common red rock formations that Southern Utah is famous for. 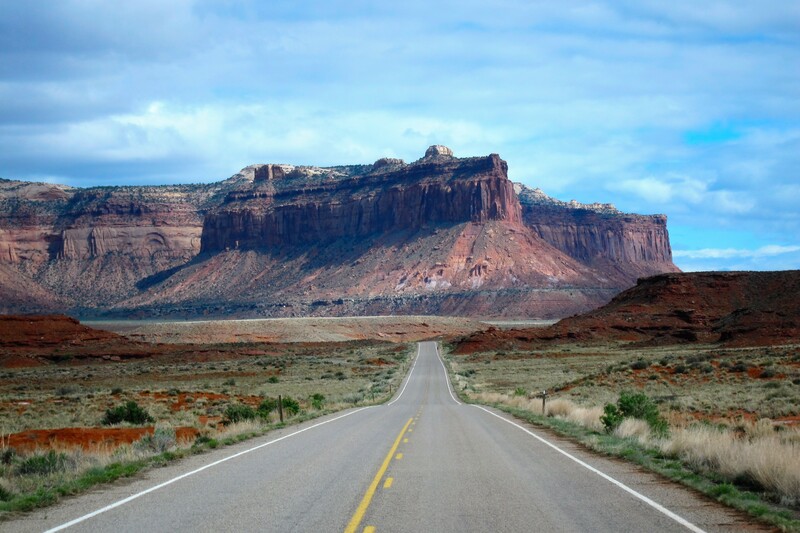 Nearing the town of Green River, a spot that Kit and I have explored in past Excellent Adventure trips and one we highly recommend visiting, we pulled off on US-191 and headed south toward the town of Moab. Upon arriving, we chose a truly unique campground just to the south of the village which made for a nice central location to explore the area. 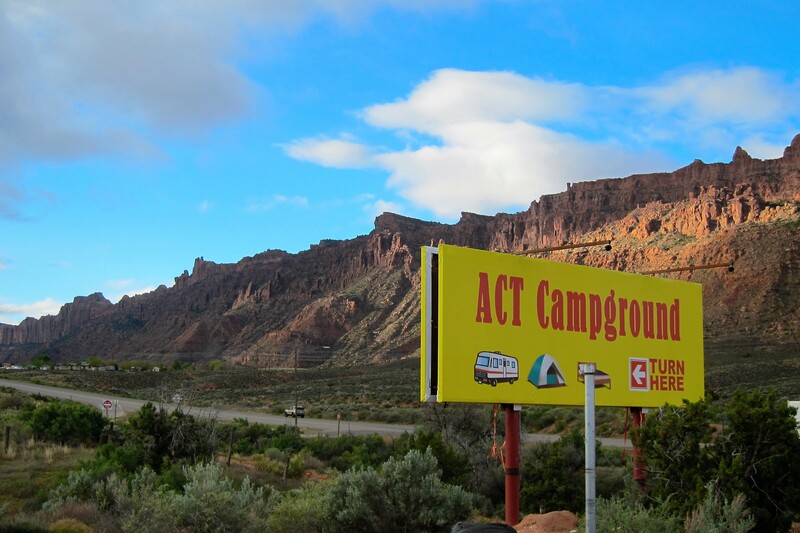 ACT Campground is a very unusual camping facility. Built, owned and operated by two semi-retired college professors (one of which taught in the University of Maine system) the campground was designed by folks that wanted to inject engineering, learning and science into their facility. The tight, uneven sites proved that their first priority was not RV accommodations, but with our relatively small rig we fit just fine. 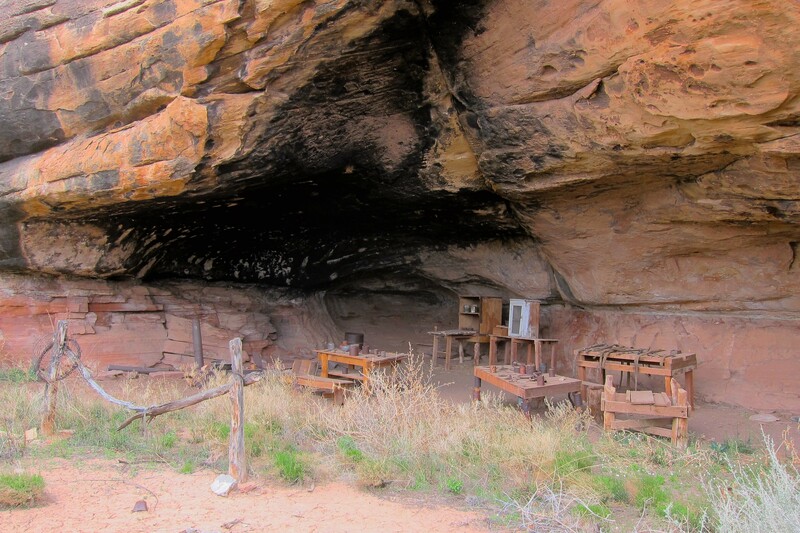 The campground has a large communal kitchen and dining /lecture facility available to guests. In addition, they encourage RV’ing educators to stop, get a break on their site fee, and hold seminars and talks in their area of expertise. While Kit and I were there, a geologist gave an interesting lecture about the environment of the area. 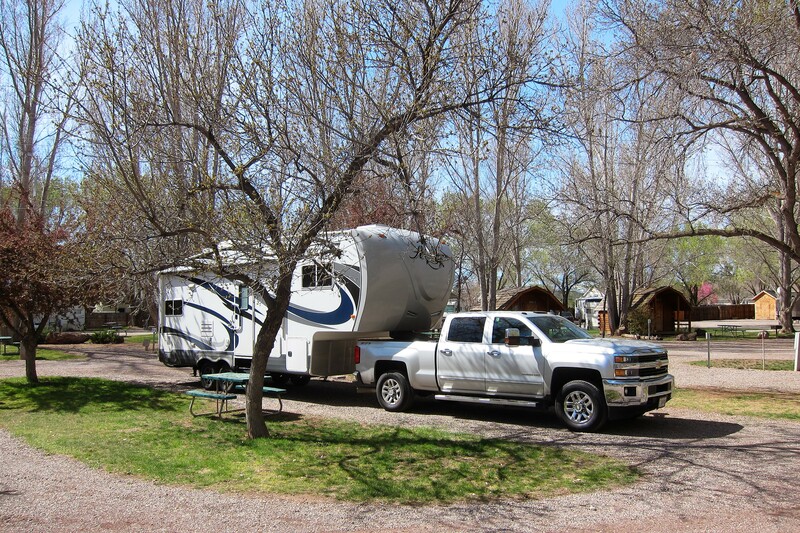 In addition to RV sites, the campground features a hostel and tent sites as well. The latter spawned the name of the campground…it’s an acronym that stands for Air Cooled Tents! The designer, an Environmental Engineer figured out a way to tap into the local geothermal resource and use a heat pump apparatus of his own design that cools the tent site pads! 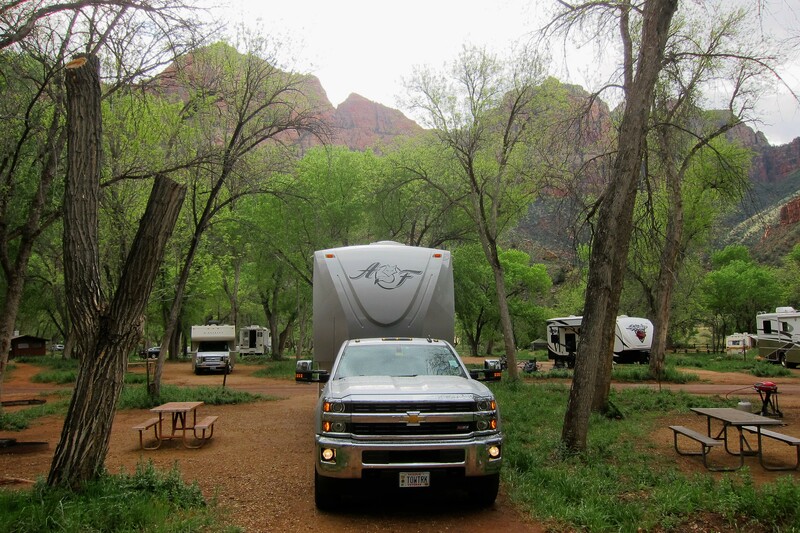 As for us, we were content to stay in our self-contained camper on the periphery of the campground. Where we could watch the setting sun play on the adjacent mountains. 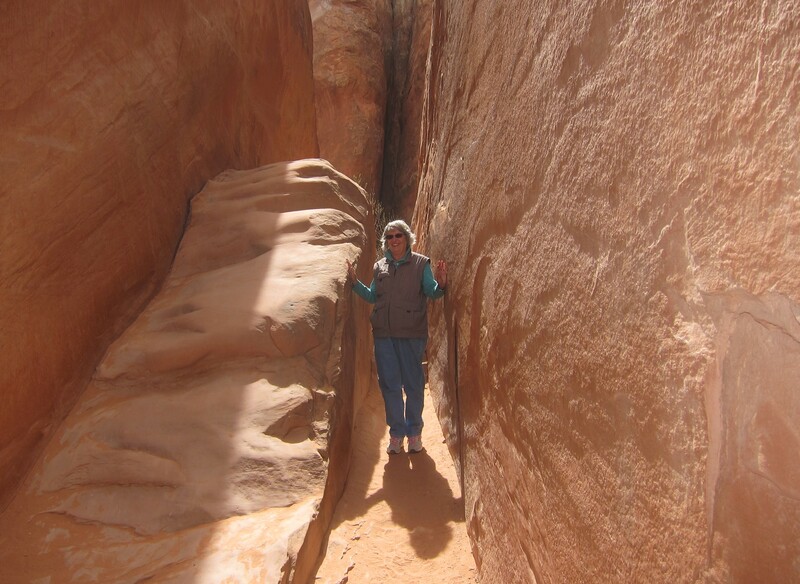 Thursday, April 14 through Sunday, April 17, 2016-Moab, Utah: We made very good use of the three days in this remarkable area…on the first day Kit and I explored Arches National Park. 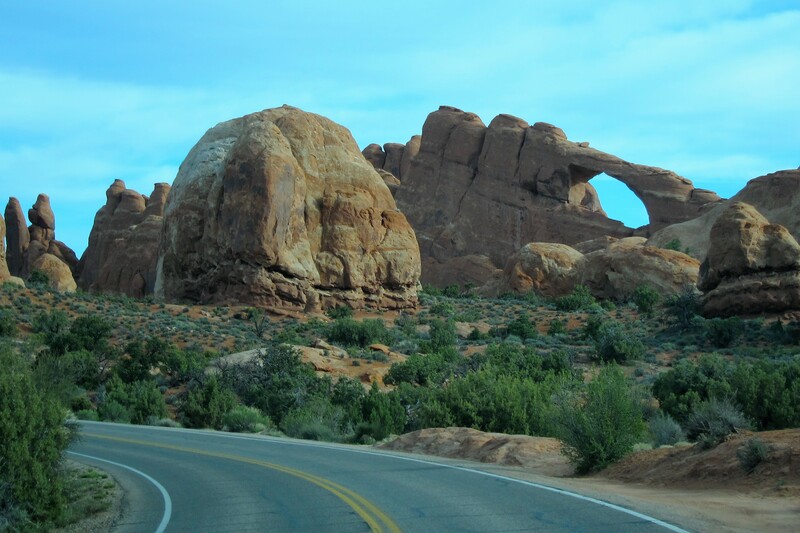 Established in 1929 as a National Monument and later upgraded to National Park status, Arches is home to over 2,000 known arch formations, and many more unique Fins and Windows, which are basically Arches that have yet to be revealed. 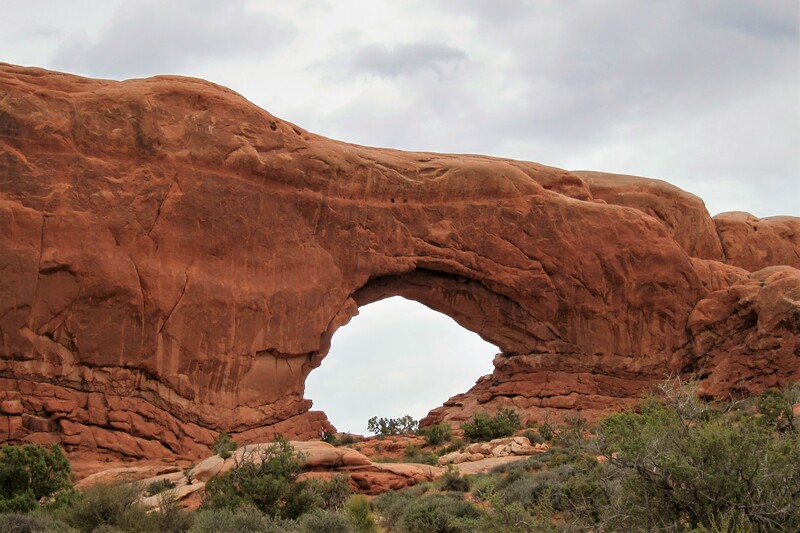 The creation of an arch starts with the uplifting and erosion of Sandstone into Fins. 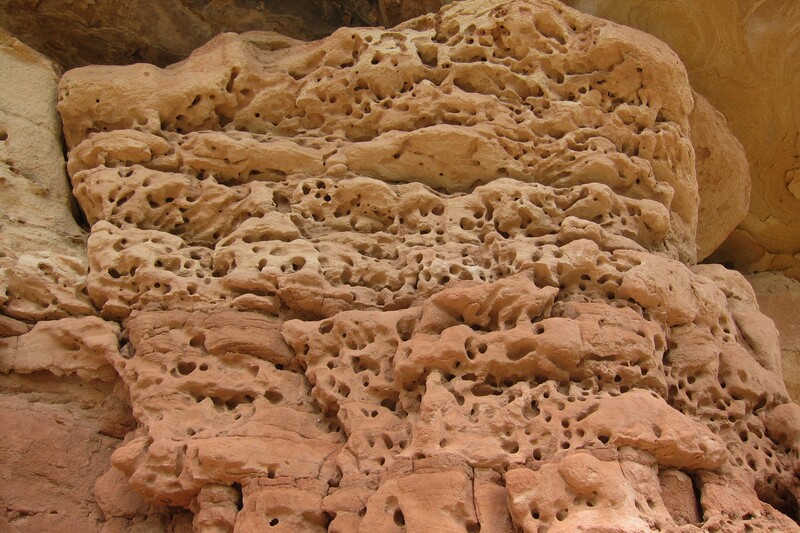 Then, continued erosion removes the less durable lower layers which creates formations called Windows. Then, as time and Mother Nature continue their work, the arch begins to emerge. 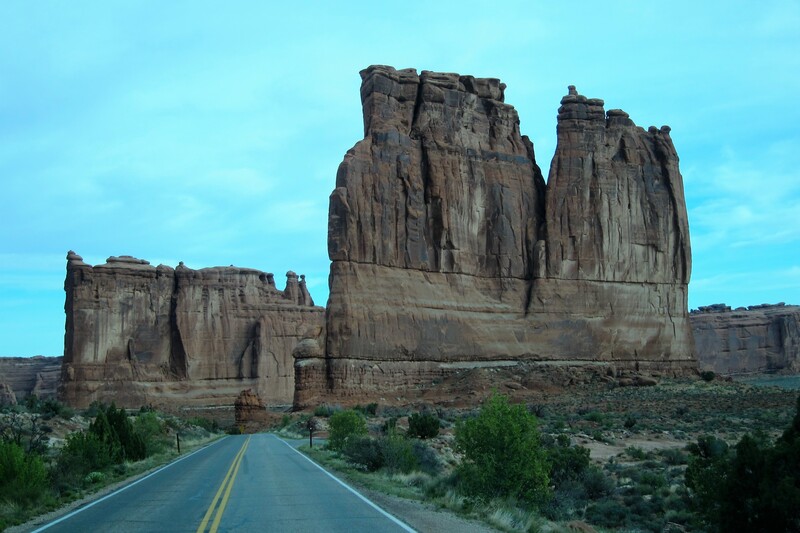 Some of these iconic formations can be observed from the park road as shown above, then there are others such as the famous Landscape Arch that one has to work at to see. 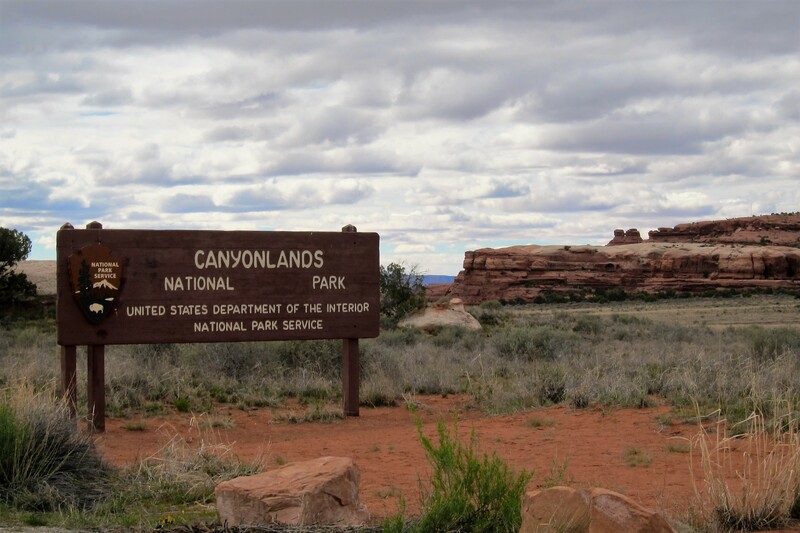 The two-mile trail is mostly flat and winds through many of the sandstone formations that litter this park. 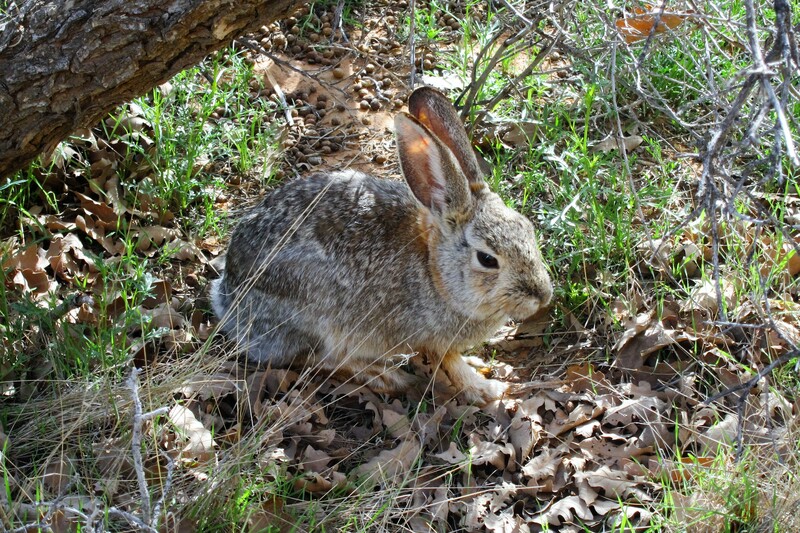 On this weekday, we had the trail to ourselves, well except for this little fellow. And this even littler fellow! However, they had little interest in the geology of the place, they were too busy foraging for food or avoiding getting stepped on. Soon, we were as close as one can get to Landscape Arch, an iconic formation that is pictured in many photos and paintings of the American Southwest. 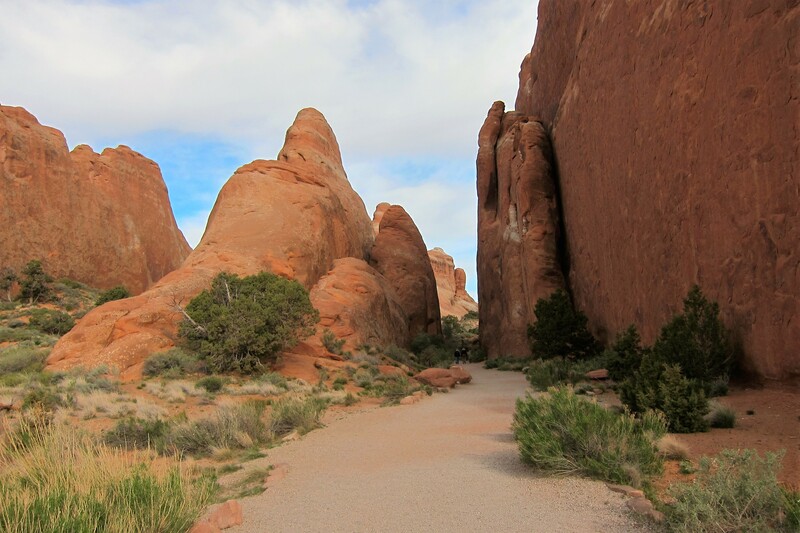 Size in this immense land is deceiving…that arch is close to 300 feet long! 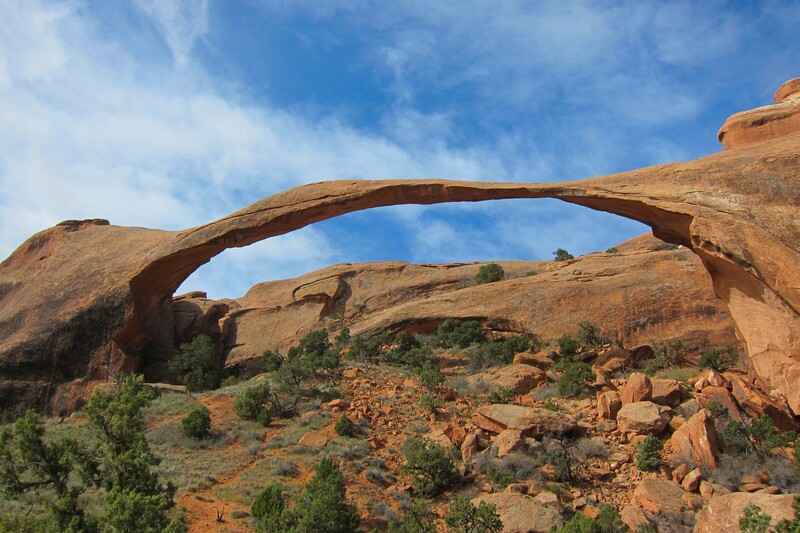 The thinnest portion of the arch is a mere six feet in width and, as most all formations in this area of the country, is continually evolving. 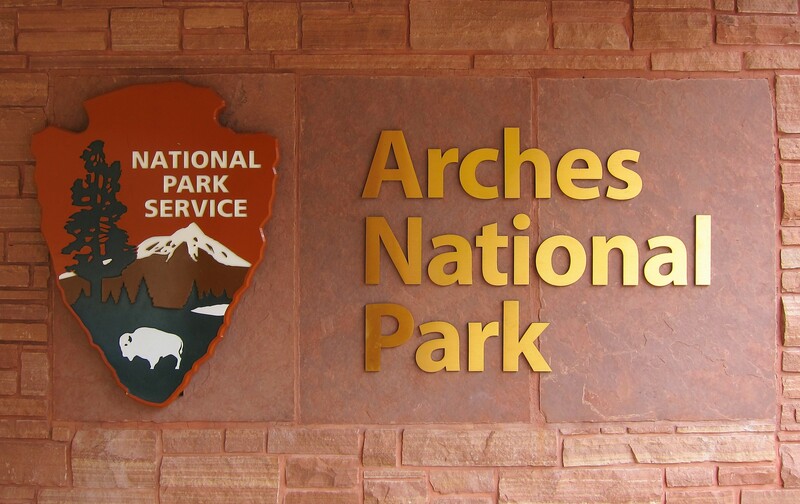 In the past twenty-five years, three huge sections have calved from this one arch which prompted the National Park Service to reroute the access trail further away as the original path led under the arch itself. 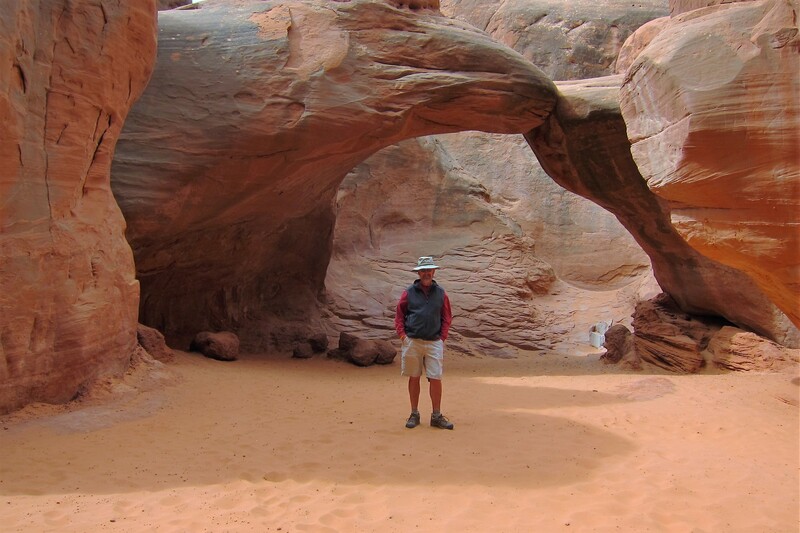 Landscape Arch may cease to exist in a very short time, or it may last another dozen years, only Mother Nature knows for sure! As in Bryce Canyon, Arches National Park features its own unique set of Spires, also known as Goblins or Hoodoo’s! 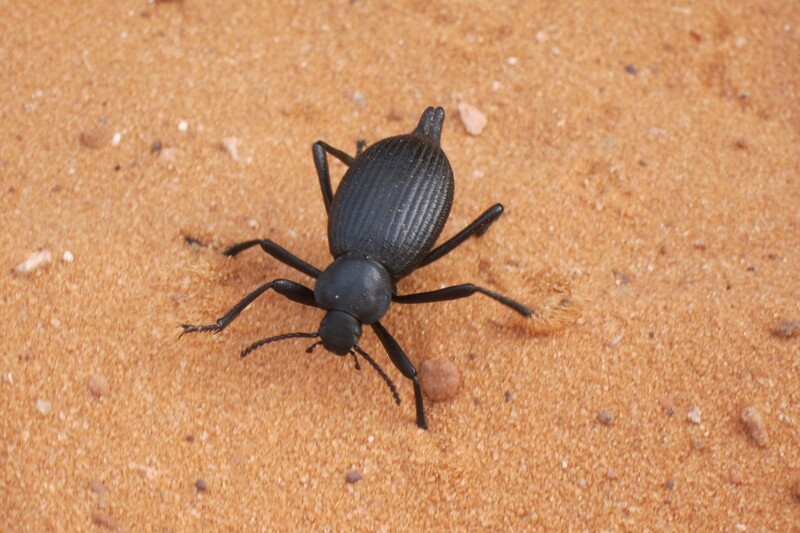 Some of these possess a circus like ability to defy gravity by balancing huge boulders. 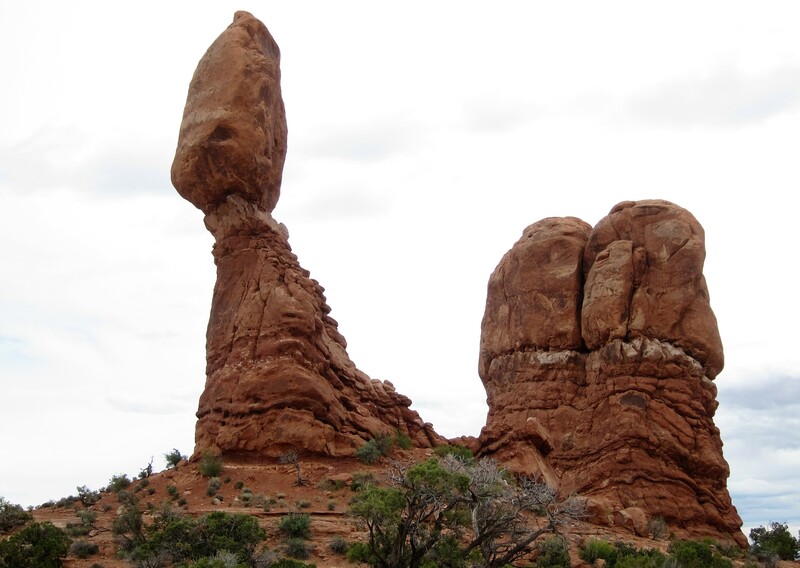 Again, perspective can be deceiving…that rock precariously balanced on that pointed base is 55 feet tall! It should be noted by those of us who are fans of Edward Abby, that he served a stint as a ranger near Balanced Rock in the mid 1950’s. 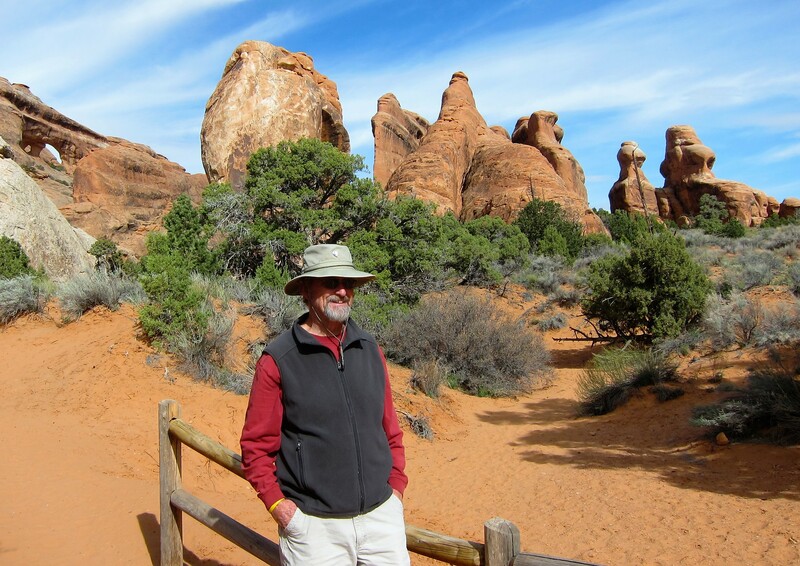 His experience living in a small camp in the desert resulted in one of the great books on the American Southwest titled, appropriately enough, Desert Solitaire! On the way out of the park, we stopped to see one more attraction. Broken Arch Rock is located down a short hike, in soft sand, which leads through some very narrow formations. Being more difficult to get to, the area around the arch is void of most other folks. A great day in another of America’s great natural places…What will tomorrow bring? Day two broke with thunder, lightening and torrential rain…a great day to visit the Moab Museum where a nice collection of local history and artifacts was enjoyed. There was even another rain refugee there playing his violin in exchange for admittance…a nice bartering outcome as he got in free, and the folks in the museum were able to enjoy his music! The rest of the day was spent ducking into dry shops and browsing about. 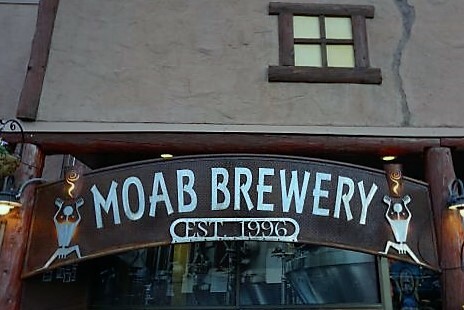 Then by midafternoon Kit and I headed to The Moab Brewery for lunch and drink. After which we called it a day and returned to our rain soaked campsite. Day three dawned kinda gloomy, but at least it wasn’t raining, so Kit and I hit the road heading south to explore Canyonlands National Park. 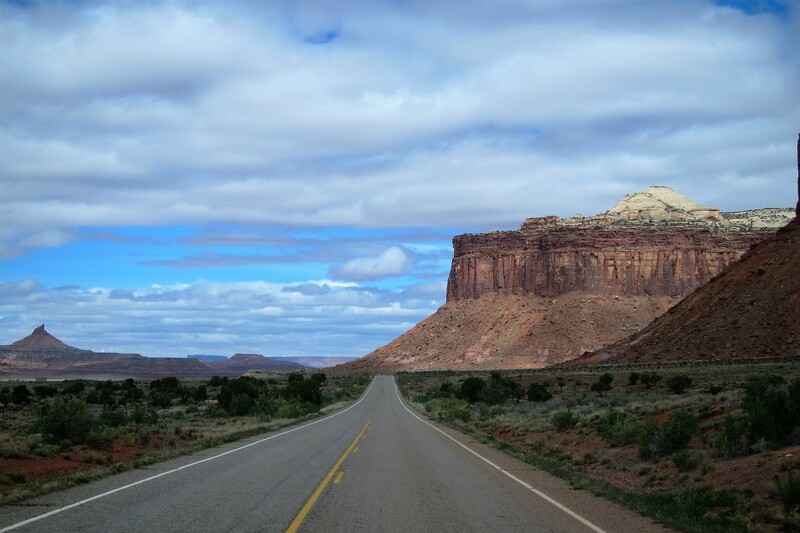 Shortly after entering the park, the skies began to clear and some of the iconic buttes and mesa’s began to appear through our windshield. This park is huge, covering 527 square miles divided into three sections. The very popular Island in The Sky District attracts more than half the daily visitor’s due to its close proximity to Interstate 70, then the much more remote and seldom visited Maze District that is only accessible by boat via the parks two major waterways, the Green River and the Colorado which converge within the parks boundaries just above the famed Cataract Canyon. And finally the portion we visited, the Needles District. As you can see, much of this sections roads are dirt, and some are suitable only for high clearance vehicles which keeps a number of folks from visiting. However, the effort is well worth it as there is natural beauty alongside scenic sandstone formations like few other places on earth. 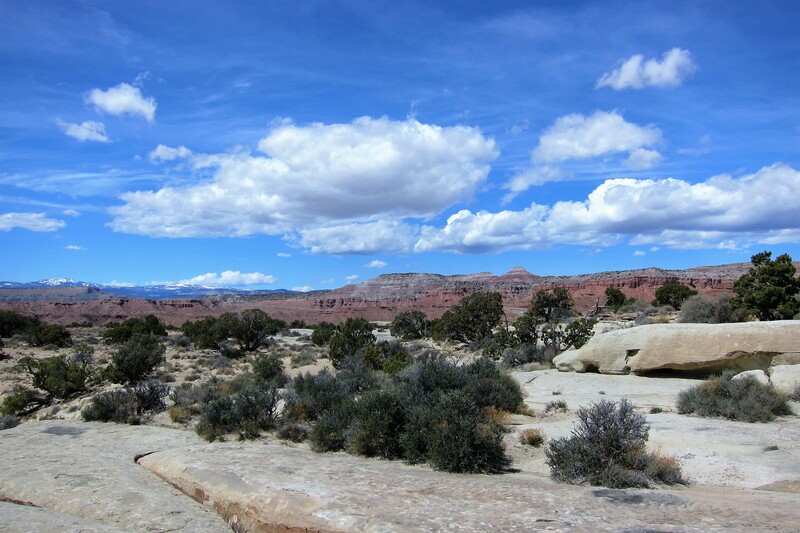 The park features many hiking trails, some which take the intrepid visitor into areas that once sheltered early ranchers tending their vast herds. Other hiking trails lead to the tops of butte’s and mesa’s by way of switchbacks or long ladders. Where you can get an up close glimpse of the handywork of Mother Nature. Or walk under a shelf over an eroded subway made by a stream that had rush through these parts centries ago. Unlike needles or pinnacles…buttes, mesas and hoodoos are formed by stencil erosion. 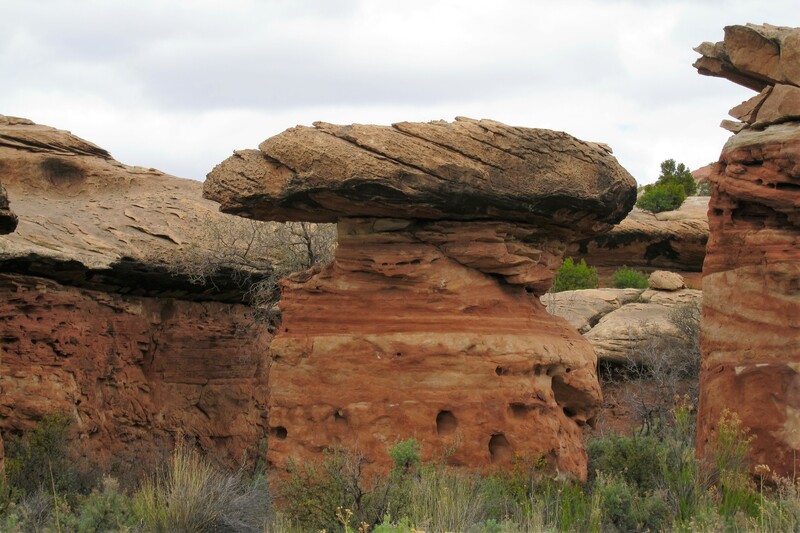 The photo below is an excellent example of how these formations evolved. 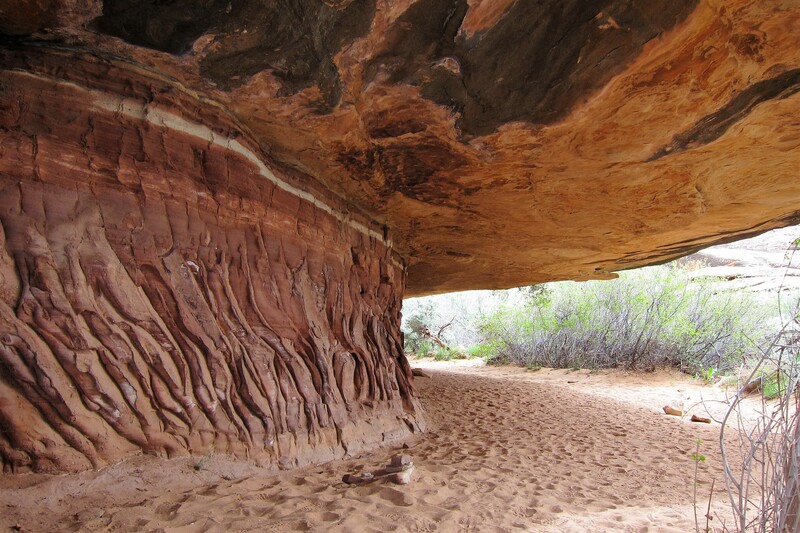 The much harder and less porous cap rock protects the underlying softer sandstone from erosion…this process creates almost all the thousands of uniquely shaped formations in Southern Utah. 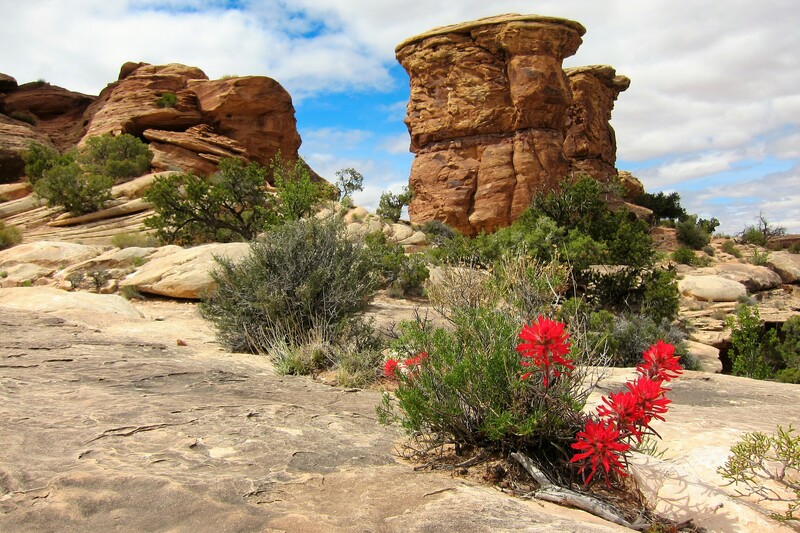 Earlier humans, now known as Ancestral Puebloans, lived in this wonderland of sandstone formations and left plenty of evidence of their occupancy. 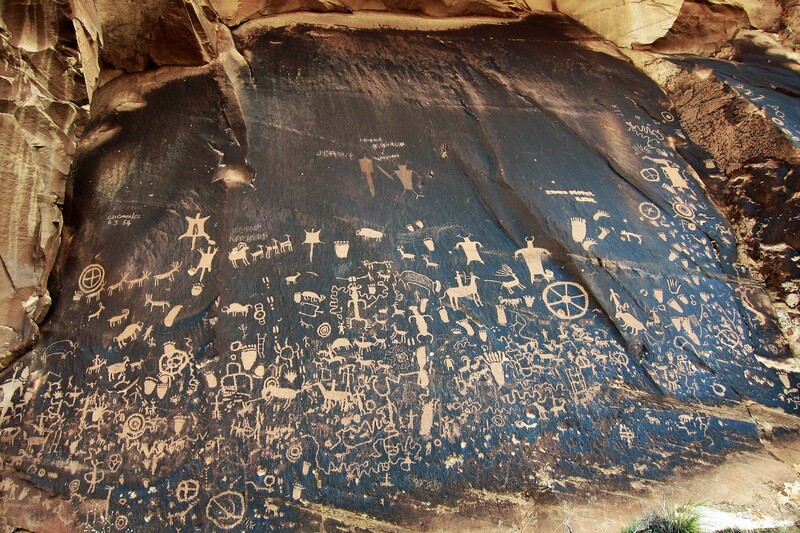 This large varnish covered section of sandstone has hundreds of pictographs and is appropriately called, Newspaper Rock. 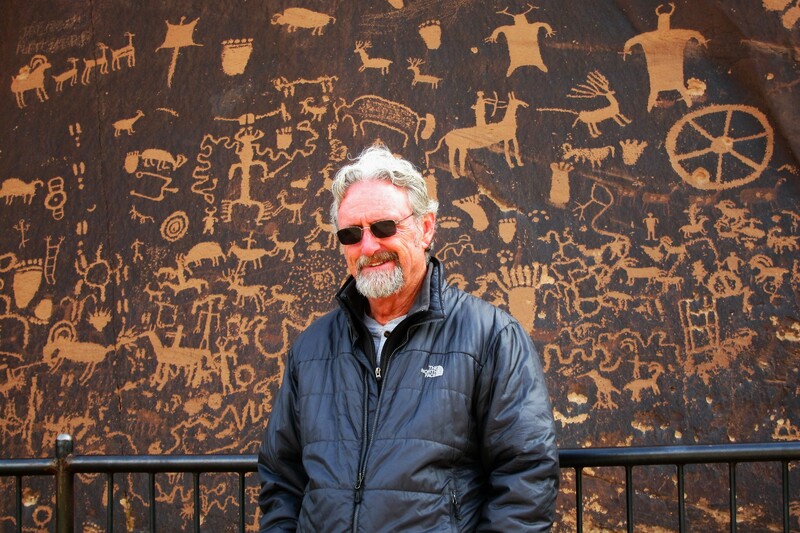 We have viewed many such etchings in our travels throughout the American Southwest, and I often wonder how old graffiti has to be for it to be considered an historical artifact? If some of the art work on bridge abutments in Southeast San Diego were left to be discovered in a hundred years, would it get the same devotion that these examples get? Yea, that’s the way my mind works…scary, huh? 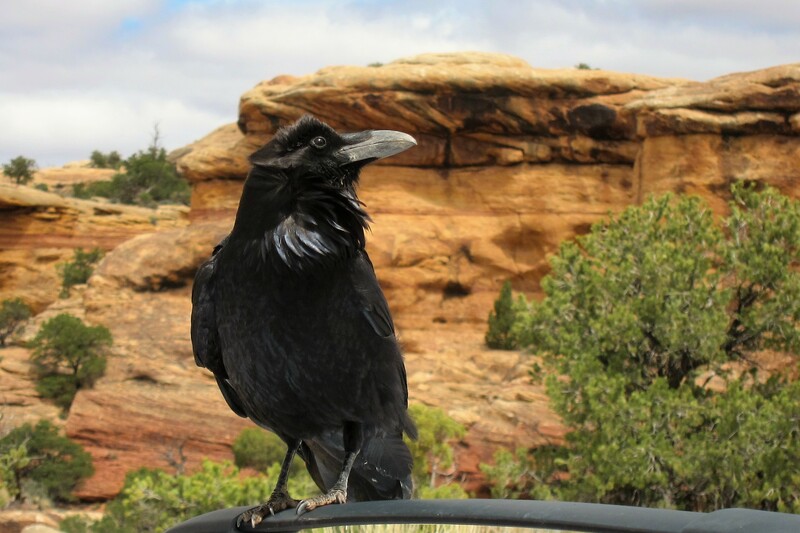 As we have seen many times over the years, ravens tend to hang around the parking areas of Western National Parks. Being adapt posers, they prance about letting you get real close in the hopes of receiving a handout. Ignore them, as I did, and they indignantly fly off to panhandle near other more gullible visitors. Since it was getting late in the day, we made our way back to pavement and headed north on the park road. 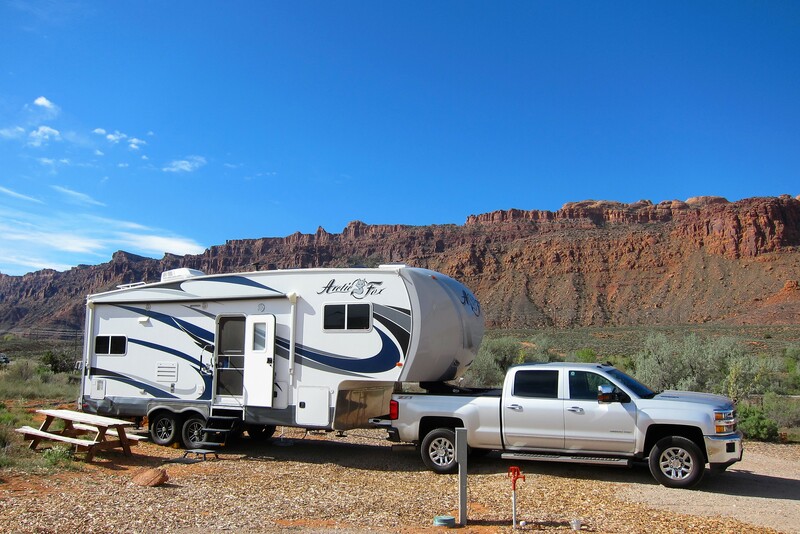 Well, tomorrow we continue East, but as we spend our final evening in Moab, Kit and I walked about the campground and marveled at the interesting terrain we’ve enjoyed and agreed the views from our campsite are almost as impressive. Oh, one last thing…in case you were wondering, the patient is doing fine and taking its wound in stride. We continue to put the old girl through more stress than many RV’s would be able to tolerate. Parts for a complete transplant have been ordered which should make her as good as new, however she never complains and continues to wear her current battle scares with honor! 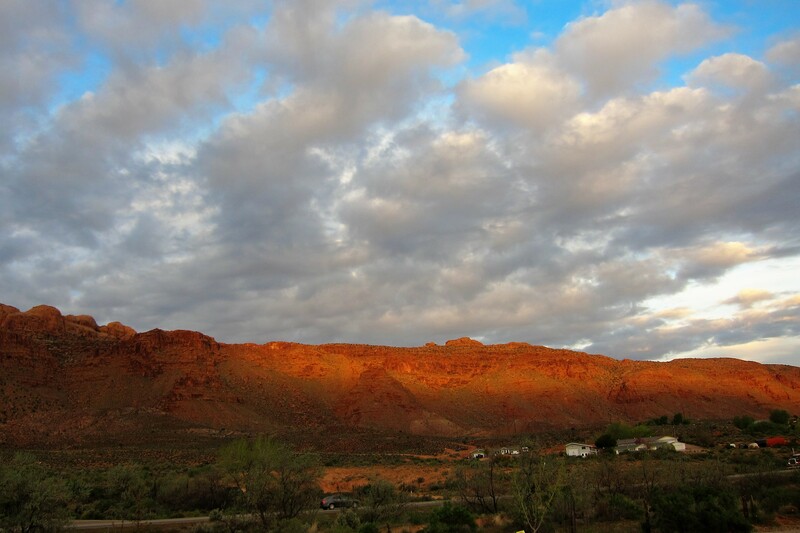 Goodnight from Southeastern Utah and please stay tuned for further episodes of Bill and Kit’s Excellent Adventure! This entry was posted in 2016 Excellent Adventure. Bookmark the permalink. I SUSPECT THAT BY THIS TIME, YOU MIGHT BE EITHER AT HOME OR CLOSING IN ON YOUR DIGS. THIS ZION ADVENTURE SURE SHOWS UP CLOSE MANY NEW FORMATIONS, MOTHER NATURE SURE CAN CARVE AND PAINT. Years ago, an elderly friend was visiting here at the bay and was preparing to depart. His Olds was parked fairly close to some trees that line the driveway, so I offered to back the car out for him. At this he became quite indignant and made some flip remark, like whatdaya think I’m blind??? well after picking up his drivers side mirror which left a permanent scar on a pine tree, he drove off with a sheepish expression on his face. Have a safe journey home!! What a majestic journal! Great job with the gorgeous photos, Bill! Spectacular scenery! 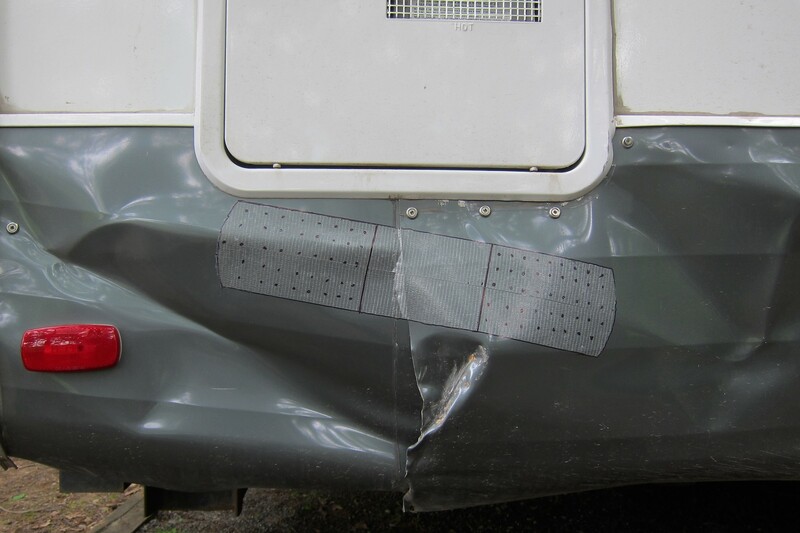 Loved the “band aid” on the camper dent. Warm and sunny here this week—–forsythia and azalea in full bloom! Love the sandstone formations and could see so many things represented in many of them (if only in my head). My favorite was one that looked as if I was in my recliner with my right foot and leg propped up! Saw lots of other things, too. The trailer’s bandaged boo-boo is on the same corner as Sterlin’s was except his was more on the back. Got back yesterday, went to Danielle’s for breakfast then grocery shopping. Dining in tonight. Put up the curtains that I finished just before we left last fall. See you soon!